Many Leeds United fans were surely licking their lips after it appeared that Norwich City may have suffered a worrying injury blow as Mario Vrancic was notably spotted limping against Ipswich Town. 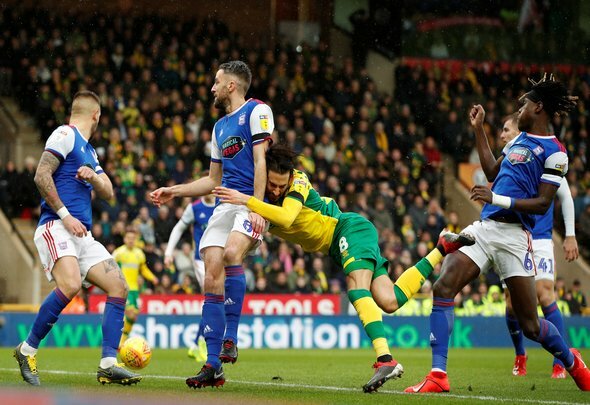 Norwich City defeated their local rivals Ipswich 3-0 in order to move back above the Whites to sit top of the Championship, but a potential injury to Vrancic will have them sweating. The central midfielder seemed to twist his ankle when trying to jump up to head home a corner in the first-half and never seem to truly recover. Vrancic tried to solider on but he ended up going down for further treatment and it wasn’t long into the second half before the Canaries were forced to substitute him, as confirmed by the club’s official Twitter. Given that the midfielder tried to carry on but simply couldn’t, it does suggest that the potential injury may cause him to at least miss some playing time, which will no doubt be a blow to Norwich and a boost to Leeds. The 29-year-old midfielder has been one of Norwich’s best players this season and has been in red-hot form in order to help them look like title contenders. In fact Vrancic has impressively scored seven goals, while assisting four, in his 25 outings in the current campaign and without him Norwich will definitely be worse for it. Norwich may have comfortable overcame Ipswich once Vrancic left the field, but in fairness Paul Lambert’s side did make it easy from them by making mistakes at the back. With Marcelo Bielsa’s side and Norwich intensely fighting to lead the way at the top of the Championship, lots of Leeds supporters will no doubt be convinced that their league rivals could struggle to continue their immense form without Vrancic to call upon. If Norwich were to drop points then Leeds could take advantage and go back to sitting pretty at the top of the table. Therefore with all this in mind while Leeds supporters would never wish injury upon any player regardless of who they play for, many fans will be licking their lips over Vrancic potentially missing games for Norwich.